Item number 2878/56 from the MOA: University of British Columbia. Short sleeve, backless embroidered blouse with long front panel. Strings attached at the neck and the midriff tie up at the back of the blouse. The pattern on the main fabric of the blouse is horizontal stripes in a colour pattern of brown, black, green, and yellow. On both shoulders and over each breast there is an embroidered flower motif with two circles of appliqué mirrors, one around the outside edge and a smaller circle on the inside. Down the centre and along the sleeves of the blouse is an intricately embroidered ‘tab’ which also contains an appliqué mirror border and a single line of appliqué mirrors in the centre of the ‘tab’. There are also three fully represented and two half represented ‘chicken’ pattern designs. Around the bottom edges of the blouse and on the cuffs of the sleeves there is a yellow material with red dots. On either side of the blouse there is the same material but in red with a green border. The tie at the top of the blouse is black. The open-back design of this kanjari is appropriately very cool attire in Banni's extremely hot desert climate. But in order to appear modestly dressed according to Muslim tradition, an essential item always worn along with the blouse is a full-sized tie-dye (and sometimes also embroidered) veil cloth called "odhani" (or "gandhi" in Kutchi). The traditional Mutwa odhani has a dark brown tie-dyed circle in the centre and broad borders on a brownish-red background. This veil is worn over the head and drapes down the back to just blow the knees, covering the entire shoulders, both arms, the back, behind and most of the legs. It is this veil that they pull down over their faces in the presence of their husbands, fathers and sons-in-law and any other male outsiders. 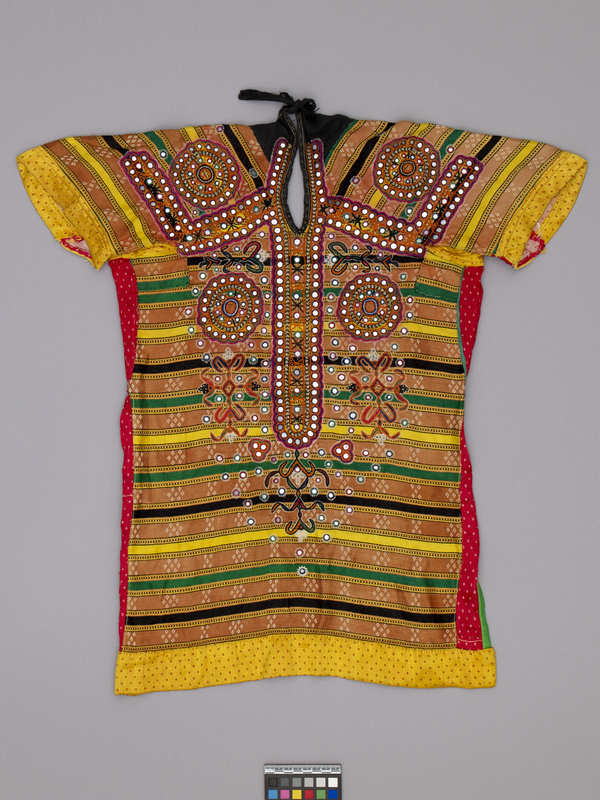 This traditionally embroidered kanjari was made by a woman from the Mutwa community in the Banni area of Kutch District. The Mutwa are renowned for their skilled and intricate embroidery and applique work. The cloth onto which the designs and mirrors are applied is a material called "mashru". Mashru is a mixed fabric woven with a combination of cotton and silk threads. It is an essential fabric particularly for Muslim men who are prohibited by Muslim law (haditha) from weaving pure silk. The tradition of weaving mashru in the state of Gujarat may have been influenced by earlier weaving traditions prevalent in Iraq and other Arab countries. Mashru used to be woven all over India but today its manufacture survives only in Gujarat State. Woven on "pit looms", ikat patterns in striped are often combined with woven patterns. The most important mashru weaving centre in Gujarat is the town of Patan but there are also some very fine quality mashru weavers in Mandavi and Surat. For the tribes of the Banni region, mashru is an acquired trade item. Previously Banni tribal women made their kanjaris (or choli) blouses and skirts out of the mote traditional "gajji" silk satin. But mashru's rich satiny appearance, its affordability compared to silk satin and ready availability made it a very popular cloth for Banni's women sewers and embroiderers in the 1980s when this kanjari/choli was acquired by the collector.